Athanasius once called the Psalms “a gymnasium for the soul.” It’s a more than fitting image, especially since it suggests something we may dread as much as desire. At times we may poke our heads inside, couch-potatoes armed with a New Year’s Resolution and a free guest pass, only to find strange machinery, discomfiting smells, and the intimidating presence of the well-versed and virile. The Psalms may be a lovely gymnasium for the spiritual elite, but for the uninitiated, they often look cumbersome and confusing. We wonder if they’re really worth the effort. In that mode, Kevin Adams’ book 150: Finding Your Story in the Psalms serves not so much as a glossy advertisement promising quick results, nor a buff and brawny trainer to shout us into fitness. Instead, Adams comes alongside as a friendly workout companion – one who knows the ways and shares the stories of how these ancient prayers have formed faith, and revealed God, to generation after generation of pray-ers. Adams commends the Psalms to us via stories, many of which are poignant and beautiful, not to mention beautifully told. 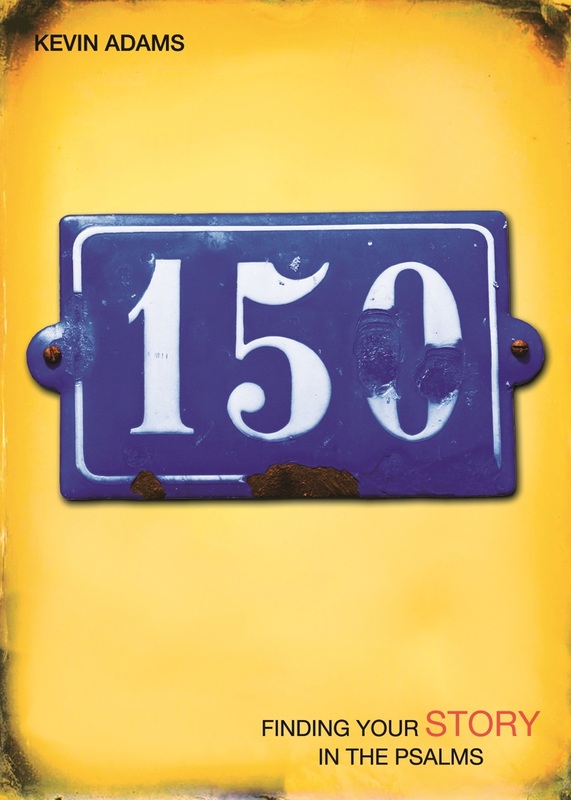 His 150 is packed with stories which evoke, wrestle with, illustrate, and embody the themes of the Psalms, and the range of the stories told fittingly parallels the breadth of the Psalms themselves. Stories include the account of the Eucharist celebrated on the first moon landing, the popularity of Psalm-singing among persecuted Pakistani Christians, to the re-appropriation of Psalm 23 by rapper Kanye West. Many of the most moving stories are those shared from Adams’ own work as a church planter in California. He meets all sorts of people at some of their most vulnerable and sorrowful moments, and he administers ancient Hebrew poetry like a skilled doctor with the right medicine, speaking to the needs of each soul. One of the many strengths of the book is that it doesn’t shy away from the hard questions many of us have as we encounter the Psalms. We aren’t accustomed to hearing in prayer the range of raw emotions displayed in the Psalms. Many of us find too many references to enemies, suffering, and militarism to fit with our purposes in prayer. Adams shows how we often settle for cheap answers on these fronts – allegorizing or selectively editing or generally avoiding. To do so is often to merely put the Psalms in the service of our own pre-determined agendas and preferences, and then miss their own surprising power and revelation. Instead, Adams shows what those who have prayed the Psalms for centuries testify to – that the Psalms model a rugged engagement with life before God in all its forms. And life, ancient and modern, includes radical doubt, intense suffering, radical injustice, and vitriolic contempt. What the Psalms do is give us a way to pray in and through experiences as intense as the darkness of depression, the sting of vengefulness, the crush of oppression, or the fog of war. By praying them, these experiences are given both honest expression, and a God-shaped formation. There are places where we might want Adams to push these questions further. For instance, how is our reading and praying of the Psalms re-shaped by the revelation of God in Jesus Christ? What does it mean, for example, for how we read the “censored Psalm” of 137? In what sense can we imagine Christ praying, “Happy is the one who seizes your infants and dashes them against the rocks?” Similar questions could be raised about chapter 10, “Battle Hymns” regarding militaristic Psalms. Can or should we appropriate such texts to our own experiences, and in what sense should we? Adams doesn’t hesitate to raise the tough questions of the Psalms, but he doesn’t give us full and final answers, either. But if the book leaves us asking some of those questions, then it has spurred in us an engagement in the Psalms that will lead us on to other voices, other questions, and other answers. These are questions that generations of pray-ers of the Psalms have not had answered prior to entering into the Psalms. Instead, they are questions that are encountered time and time again as we read and meditate and pray through these texts. What Adams gives us in this regard are not definitive answers, but evocative suggestions and possibilities to get us reading and praying the Psalms with the church. Above all, Adams provides a rich introduction to this way of life and prayer via the Psalms. No quick results. No cheap shortcuts. But the wisdom of souls in formation, exercising regularly and wisely with the Psalms. As generations have attested to, reading, meditating on and praying these Psalms expands our spiritual cardio-vascular and muscular systems, forming us into a people who can live in the midst of tensions, uncertainties, and chaos, and do so while remaining engaged with God. They show us a way of interweaving faith and life without ignoring the complexity of either, or simply collapsing one into the other. Without the Psalms, our lives of faith and prayer would be unimaginably diminished. With them, as Adams show, they are immeasurably enriched. All of this was in my mind as I spent time recently visiting a seasoned saint from our church in a rehab center. The workout room was full of activity – legs being toned, muscles being stretched, reflexes being honed. And all of this was happening with the gracious, yet persistent, presence of therapists spurring injured and recovering bodies to greater strength and health. Adams’ book plays a similar role with the Psalms, encouraging us to take up our exercises, used by the Spirit in so many lives to console, stretch, convict, and relieve. It’s enough to inspire even the most determined spiritual couch-potato to hit the gym. Darrin Compagner serves as Pastor of Blythefield Christian Reformed Church in Rockford, Michigan, and has been involved in a number of initiatives to encourage prayerful discipleship. He currently lives in Rockford along with his wife and four children, all of whom are kings and queens of Narnia.